Hello survivors of the end of the world :) ...that never came to be, this is my first beauty review post so bare with me on the ethics of reviewing products since I am a newbie at this. I'll try my best to describe how each of the products work for me and then you can decide whether or not it will work for you or not. We are all born with various skin differences so you can believe my experiences or find out on your own. Both products are from the Drugstore! For those of you who do not know, I am twenty one years old, and I am new to the anti-aging skin care world which is why I am experimenting with low to high end products. The L'oreal Revitalift Double Lifting Cream first caught my attention when it was featured on the Dr. Oz show. After reading a vast amount of reviews for this product, I decided to give it a go. It cost $14 which to me isn't a huge chunk of money wasted since similar products tend to cost in the 30's and beyond. Packaging - Is a plus for me, I hate skincare products that are in a jar container. This product features a duo pump. One side distributes a concentrated lifting gel and the other is the anti-wrinkle cream. They come out at the same time and one pump is enough to cover my face and neck. 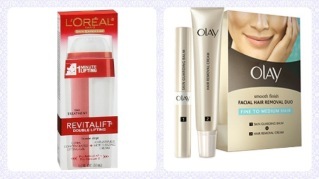 Price - As I recall, it is between $14-$17 at a drugstore and the price is not as bad as most anti-aging products. Skin Allergic Reactions - I did not have any skin sensitivity after using this product for week. Scent - The scent is very light, which is a bonus. Heavy scented products are usually indicate a odor the producers want you to be unaware of. Whether it is a chemical or something foul smelling. Texture - Its legit, the gel is what you think it would be. The cream is very light. Combined they are still light weight and they do not weight my skin down. I woke up every morning for a week and I did not feel any oily-ness on my skin. Other info - It is not greasy at all, very light weight. It also did not clog my pores. Does it work? How did it work for you? In conclusion, yes I saw results instantly. The claims on this product is that it will give you a result in approximately a minute. This product also contains retinol and no I am not a doctor of any means, but I know for a fact that retinol is a higher concentration of vitamin c. Vitamin C also helps produce a brighter complexion. Would I re-purcahse is product again? Yes! And I do recommend this product for those interested in anti-aging skincare from the drugstore? Definitely. If you have extremely sensitive skin, retinol may not be for you. I also recommend if you are wearing this during the day time, to wear a sunscreen based product on your face because retinol will cause sensitivity in direct sunlight. I have to admit, I am very self-conscience about my peach fuzz. Okay let's face it, its a girl mustache people!! I find it so useless, but any who the skin where the fuzz is resting is probably my most sensitive spot next to my eye area on my face. Solution? There is waxing, laser treatments, and then there are over the counter remedies. The Olay Hair Removal Duo for Fine to Medium Hair (not to get confused with is secondary product, which is the one for medium to course hair) is a treatment that not only get rid of this annoying fuzz, but also does it in a gentle way. Before I used this product, I use to use the Sally Hansen version which really irritated the skin. Packaging - Step one is a balm in which you apply first. It feels like a lip balm. Step two is a cream and the tube is shaped like a lip gloss, with a slanted tip for easy application. I find step two not as sanitary to apply, but it works well. Price - Expensive. The Sally Hansen one I use to use cost $4-$7 and this one costs $19-$23! I spent $22. Skin Allergic Reactions - I did not have any strong skin sensitivity, it was a little red after at one spot, but the next morning it had dissipated. Scent - The scent is very light, it smells like a lotion. Compared to Sally Hansen (strong chemical scent) I love it! Other info - For the price, you do not get as much product as you would want after forking over $20-something. Yes & no. Let me break it down for you. This product is meant for those of you who have sensitive facial hair areas. For that, this product true. It did not leave me with a burning sensation what-so ever. Whoever, I had to use this product twice in order to achieve a fuzz free upper lip. Which is my own fault for getting it waxed a couple months back, the girl did a bad job honestly which is why I do not get my upper lip waxed. Anyways, I used it back to back and I again did not have a burning feeling, I did have small red spot that disappeared in the morning which is normal I guess. This product works, but not on my first try. Compared to the Sally Hansen, it was worth buying because it did not have a nasty odor and it did not burn my upper lip. Olay makes a stronger version of this product which is for medium to course hair so if you are looking for a stronger product, I would try that one. If you have issues with sensitivity on your upper lip, I would try the fine to medium first. Would I buy this again? Honestly, I do not know. I don't hate the product, I like it, but I think I would have to use it more and more before I have a definite answer. I think using the L'Oreal products are best suited for the people who are suffering.It is best solution.